AT THIS TIME THE SUMMER TRAINING CAMP IS NOT PLANNED FOR 2015. 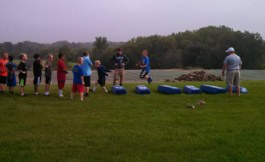 The Wildcat Summer Sport Performance Training Camp will work to develop the Speed, Quickness, Agility, and Power of young athletes in the Davenport Wildcat Youth Sports Program. Each week participants will have exposure to a different sport and work directly with the North Coaches and athletes. This program is not only intended to improve the athletic abilities of the young athletes but to help establish the good habits of fitness and exercise. We will also build their confidence and PRIDE as future WILDCATS. This fun and exciting program is for Boys and Girls 7 years old to 6th grade. We will be able to use the indoor facilities; we will be entering through the Activities Entrance on the West side of the school or the Gym Lobby entrance. What to bring:BRING WATER EVERYDAY!! !